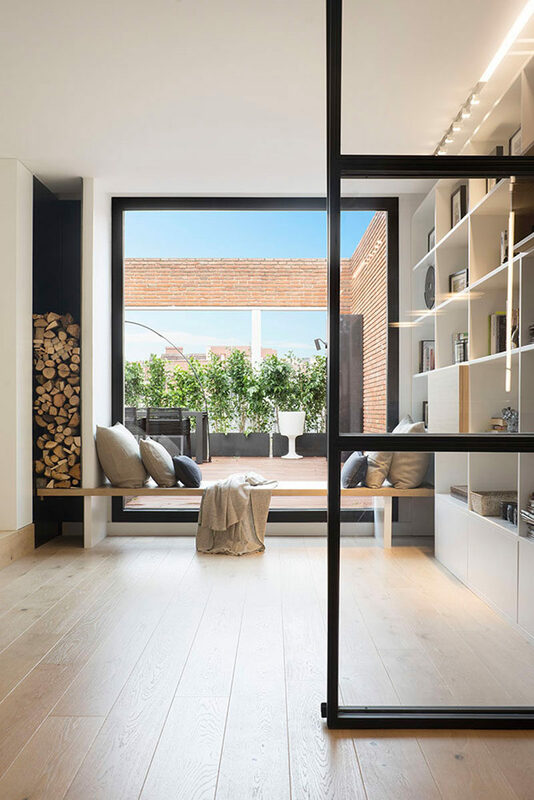 Susanna Cots Interior Design have completed the interiors of a penthouse for a family in Barcelona, Spain, that features plenty of black-framed glass throughout. Outside, there’s entertaining space and a water feature. Potted plants provide privacy from the neighbors next door. Inside, the interiors of the home are bright with white walls that contrast the darker elements, like the furniture, fireplace and door frames. A wall of built-in shelving provides a place to display books and decorative pieces. 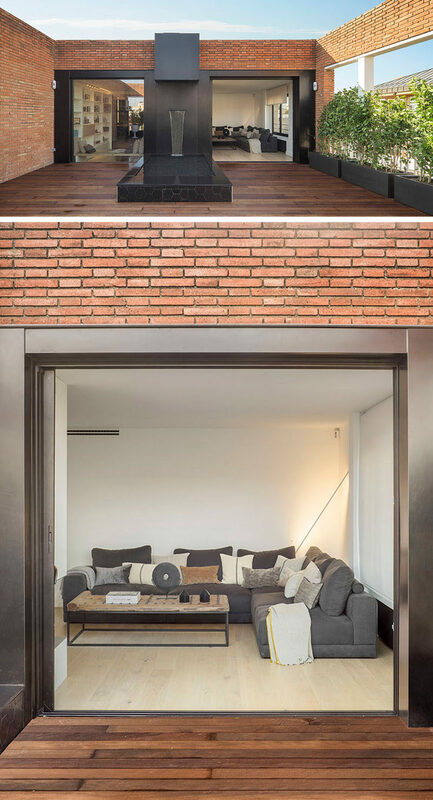 A built-in wood window seat sits between the shelving unit and the firewood storage, while the large window provides plenty of natural light and views of the outdoor space. Next to the living room is the kitchen. 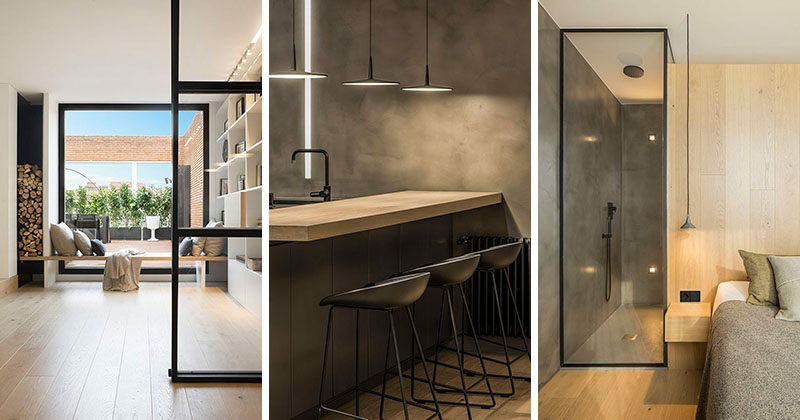 A line of light travels through the spaces and creates an interesting visual effect. 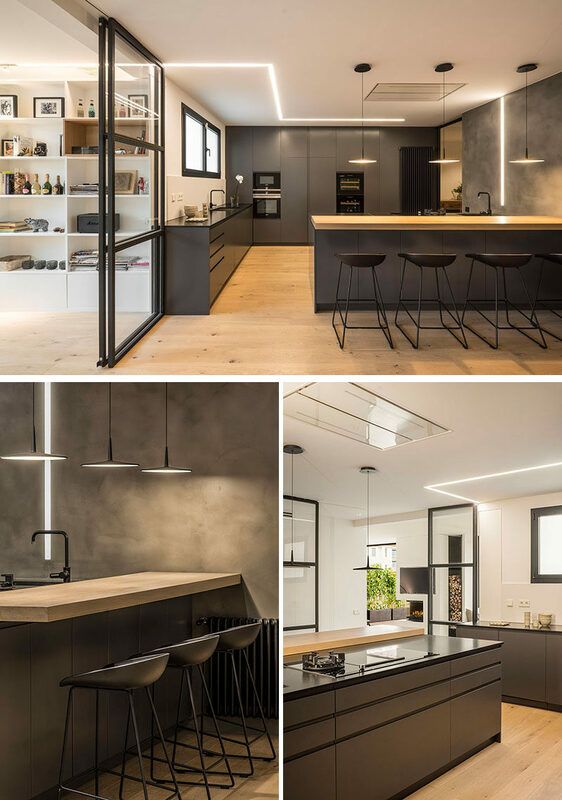 Grey cabinets have been paired with black and wood countertops for a contemporary appearance. 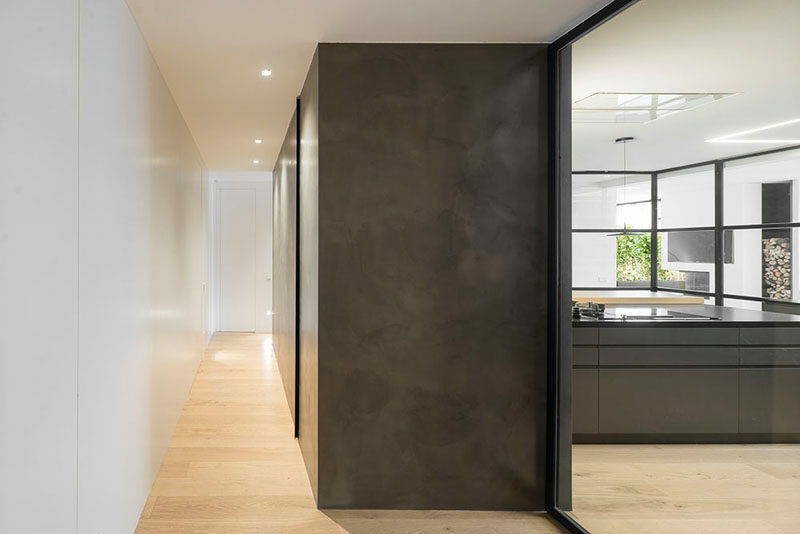 Black framed glass walls can be used to close off the kitchen from the other spaces of the penthouse when needed. Opposite the kitchen and hidden behind the white wall are a couple of bedrooms. 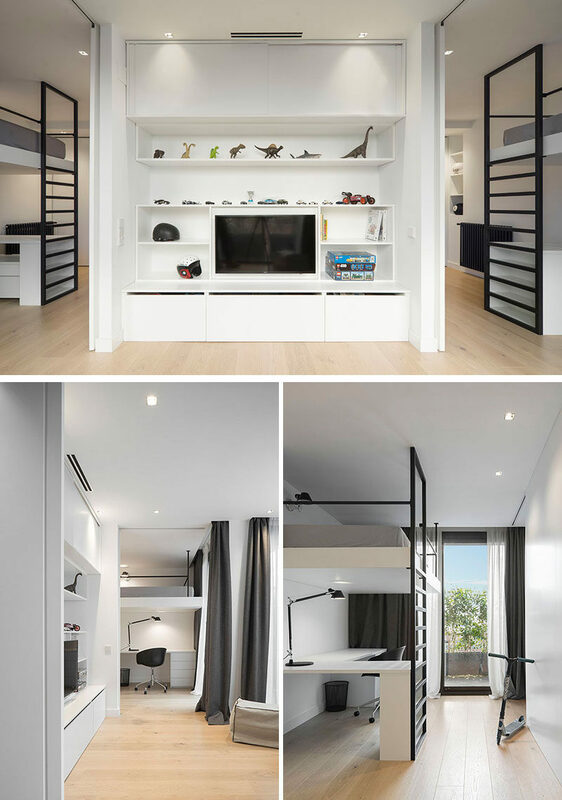 Each bedroom has a single bed with a built-in floating desk. These two bedrooms are a mirror image of each other and share a common bathroom. Down the hallway that wraps around the side of the kitchen is a dark box. This dark box houses a powder room. Further down the hallway is another bedroom. This time, wood has been introduced in the form of a headboard, while the black framed glass enclosed shower is visible to the room. The entrance to the shower can be found in the walk-in closet, that’s full of shelving. Some of the shelves also have strips of lighting to add additional light to the space. Behind the walk-in closet and closer to the door of the bedroom, is another bathroom. This bathroom has two rectangular mirrors that are mounted above the large dual-faucet sink. Continuing down the hallway, there’s another bedroom. This bedroom has two sleeping areas that open up to a common tv area with shelving and storage. Each bed is lofted to provide space for a desk underneath and sliding doors can be closed for privacy. This bedroom also shares a common bathroom that has dual shower heads in a single wet room. Outside the bathroom there’s a simple built-in vanity area.